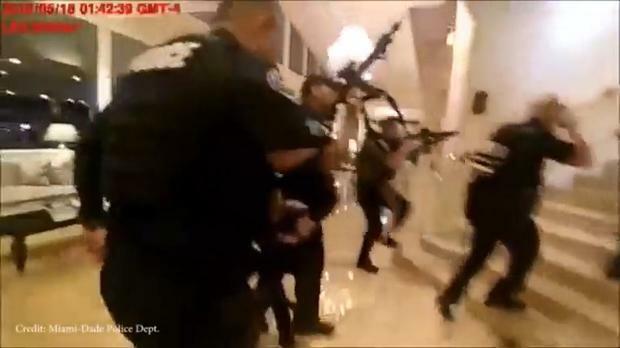 Police in Florida have released some of the bodycam footage captured by officers during a shootout at Trump National Doral Club near Miami. One officer received a broken arm and the suspect was arrested after being wounded by gunfire in the incident, which began at around 1.30am on May 18. Miami-Dade Police Director Juan Perez identified the suspect as 42-year-old Jonathan Oddi, of Doral. In plotting the ambush, “he did succeed and he did lose”. Mr Perez said the man tore down a flag from the rear of the complex and draped it over a lobby counter. “He was yelling and spewing some information about President Trump and that’s what we know so far. And he had an American flag that he did drape over the counter,” Mr Perez said. The man fired shots into the ceiling and waited for officers to arrive, he said. After an exchange of gunfire the suspect was arrested. Independent.ie Newsdesk US President Donald Trump has vetoed a resolution passed by Congress to end US military assistance in Saudi Arabia's war in Yemen.